It takes no prep work or reading ahead on my part. Hallelujah. Just turn the page and go. Grammar takes about a mere 20 minutes a day, and we do it somewhere between three and four times each week, on average. Many school subjects in our curriculum do not start and end with the traditional school schedule. For example, math we are about 3/4 of the way through our book. Spelling we just moved up to a new book. And writing we are still at the beginning of a book. I do not march my books and student assignments out at the beginning of the year, but I always periodically take measure of where we are at, what we are doing, and where we need to regroup. In grammar, we pretty much follow a traditional year. I will describe my take on them and how we use them below. Please notice the student’s preference for gluten-free bread. Too bad all curriculums (curricula) seem to like to make use of references to food. 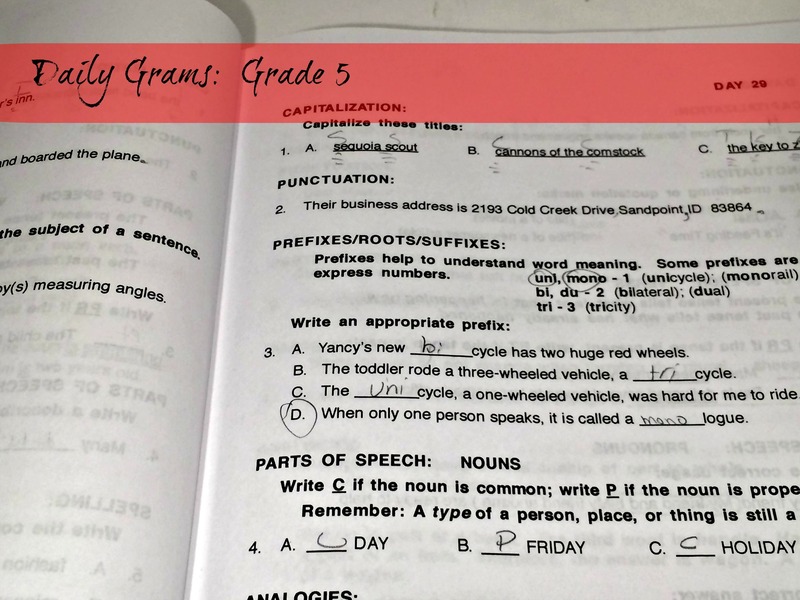 Easy Grammar: Grade 5 is the more traditional manual. It succinctly explains grammatical concepts and then follows each concept with worksheets dedicated to that specific topic. At the end of each unit are four “tests” you can use: a practice unit review, a “real” unit test, a cumulative practice review, and a cumulative “real” test. I do not all of these tests/reviews. I pick and choose. Sometimes we do the unit test. Sometimes we do the cumulative test. Sometimes we do both. Generally, we do 3-4 pages of the manual’s worksheets a day, and we finish early in the school year (about 3/4 of the way through a traditional year). After we finish this grammar book, we try to focus on writing more. Please, it is important to note that there is a teacher’s manual and a student manual. I buy the teacher’s manual for my daughter to use. It is actually the teacher’s manual on the left side of the book and the student manual on the right. The pages mirror each other–except the teacher’s side has a few extra teaching pointers and the worksheets have the answers filled in. Make sense? The answers to the student’s worksheets on the right side of the book are posted glaringly there on the left teacher’s side for the student to look at if they wish. Obviously for some students, this just won’t work! For some, it is no problem. 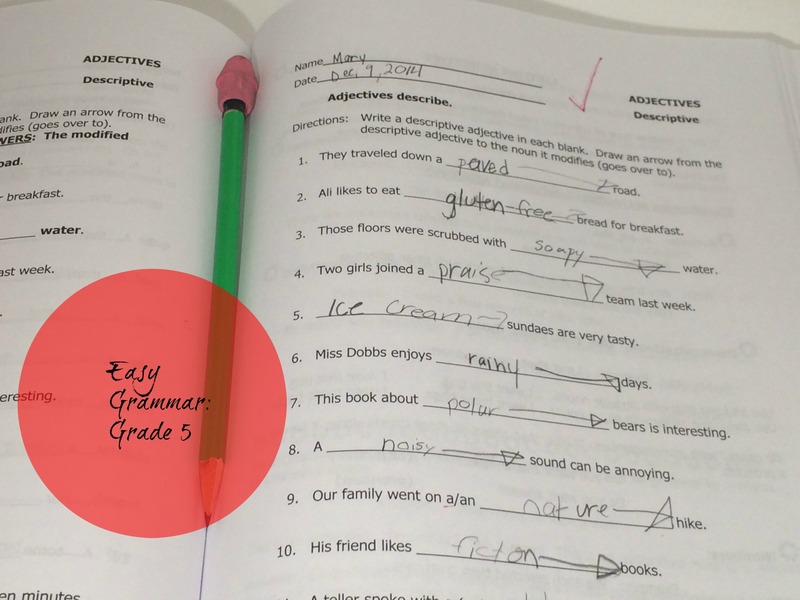 If it is problematic, you can buy the Easy Grammar Grade 5: Student Workbook for the student AND Easy Grammar: Grade 5 Teacher Edition to check their work and get teaching pointers. Or, you can buy the teacher manual and make copies of all of the student worksheets and tests you want from the teacher’s manual. However, if you hang your kids from the ceiling by their ears like I do for “cheating,” then maybe you can do what I do and just use the teacher’s manual. Daily Grams: Grade 5 is a workbook with 180 worksheets which build in a cumulative fashion. It goes along with what is taught in the manual I discussed above. Each worksheet has about 5-6 questions, and literally only takes five minutes (tops) to complete. I like that one of the questions always requires the students to put together complex sentences. I buy the Daily Grams: Grade 5 Teacher Text, and this nicely places the answers at the end of the book (not like the main textbook I discussed first). The Daily Grams Student Workbook does not come with answers. Nine times out of ten I don’t need them, but it is getting to where I sometimes do! If I happened to be really good at grammar, I could get by with just the Daily Grams and not even use the manual I first mentioned which teaches topics. I could just teach the topics as they are encountered in the cumulative Daily Grams myself. I be not that good. So I buy the Easy Grammar text book with the answers AND the Daily Grams with the answers. We do one or two Daily Grams pages each day we do grammar. Sometimes I will pick and choose the questions they do, so they are not wasting time on material they know very well already. We will finish the Daily Grams book on the traditional school year, but it takes us longer than the manual I first mentioned (Easy Grammar: Grade 5). One last thing I incorporate into Daily Grams is having them write the required sentence formation question in cursive. That way they are frequently practicing cursive handwriting. That’s it! That’s our grammar! Nobody paid for this review. And I get no kick-backs. It’s a sound grammar curriculum, but not pretty or exciting. We will stick with it because I like its conciseness, thoroughness, and I really like Daily Grams. I also like that I’m not needed too much. In general, I’m not a good curriculum shopper, and this is working well for us. If it’s not broke, I don’t look to fix it. The enemy of good is better. I feel like my kids will have a great grasp of grammar with The Easy Grammar System. How about you? Do you do formal grammar? How’d you pick your text? Does grammar take all year? Do you do it every day? Are you good at it? Did you like it when you were a kids? This entry was posted in Fifth Grade Curriculum, Grammar, Homeschooling and tagged a doctor who homeschools, daily grams, easy grammar, Grammar, Homeschooling, opinion, Review on May 13, 2015 by thehomeschoolingdoctor.